Your regularly scheduled programming will not be seen tonight so that we may bring you the following ABC Special Presentation, Part Three of The Super Friends Go To Washington. 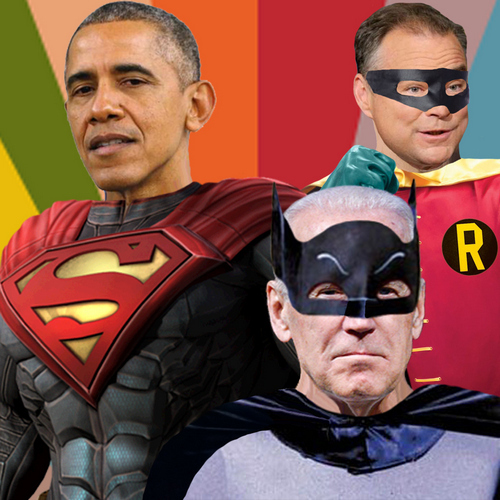 Starring: Tim Kaine as Robin The Boy Wonder, Joe Biden as Batman The Caped Crusader and Barack Obama as Superman The Man of Steel. With special appearances by the Rev. Jesse Jackson, Star Jones, Sigourney Weaver, Lee Daniels and Angela Bassett. With a musical performance by Lenny Kravitz. When we last saw the Super Friends, they were rejoicing in the success of the first half of the Democratic National Convention. Wonder Woman had been made the first woman presidential nominee of a major political party. And Bryan Cranston was there, too! Little did the foul Trumpocalypse know that his mild act of treason played right into the hands of the Super Friends who were about to put their biggest heroes on stage – Batman, Robin and Superman. The Justice League had a great opening act. The Rev. Jesse Jackson spoke in rhyme. Star Jones talked about being fired from Celebrity Apprentice because she fought with Meatloaf. Sigourney Weaver is still alive. Lee Daniels said Wonder Woman knows him. And Angela Bassett looked lovely. On the Legion of Doom's vast right wing conspiracy to undermine Wonder Woman – "Tarnished reputations are unfortunate, Robin. We can live with those. However, a threat to all of Gotham City is something else." On Terror – "Haven't you noticed how we always escape the vicious ensnarements of our enemies? I like to think it's because our hearts are pure." On the Economy – "The glamour, the romance of commerce... Hmm. It's the very lifeblood of our country's society." On Foreign Affairs – "England has a queen, and a great lady she is, too." "Language is the key to world peace. If we all spoke each other's tongues, perhaps the scourge of war would be ended forever." On Immigration – "What's important is that the world know that all visitors to these teeming shores are safe, be they peasant or king. If we don't know all about our friends to the south, how can we can carry out our good neighbor policy?" On Trumpocalypse – "Experience teaches slowly, Robin. And at a cost of many mistakes." Batbiden had the crowd chanting "USA! USA! USA!" Batbiden ended his speech by exclaiming, "Come on! We're America!" And who can argue with that? And now, a musical performance by Lenny Kravitz. I missed it. But I'm going to assume he sang "American Woman." The lyrics don't really fit the moment, but the title does. I accept your nomination for Vice President of the United States. Holy Crucial Moment. I will proudly serve alongside the next President of the United States and first woman President, Wonder Woman. Holy History. Wonder Woman and I vow to continue to build on the progress Superman Obama has made. Wonder Woman is not about to let the spineless Trumpocalypse take over America, the greatest country ever. Holy Hallelujah. Now, please enjoy my mediocre imitation of Trumpocalypse. Never believe a person who says 'believe me.' He says, "I will build a wall to keep Mexicans out. Believe me." Holy Green Card. He says, "America needs a President who wrote The Art of the Deal. Believe me." Holy Ghost Writer. "I will repeal every word of Obamacare. Believe me." Holy Unrefillable Prescriptions. "I will ban all Muslims. Believe me." Holy Bill of Rights. "Global warming is a hoax. Believe me." Holy Endangered Species. Just this morning Trumpocalypse made a declaration of treason. Holy Benedict Arnold. Trumpocalypse as President? I say Holy Fate-Worse-Than-Death. "Robin Tim Kaine did a terrible job in New Jersey – first act he did in New Jersey was ask for a $4 billion tax increase and he was not very popular in New Jersey and he still isn't." "Hey, Trumpocalypse. Robin was governor of Virginia, not New Jersey, you dope." Trumpocalypse shouted something about meddling kids, then murdered a puppy in a fit of rage. And now... Look! Up in the sky! It's a bird! It's a plane! It's President Superman Obama! President Superbama flew onto the stage. The crowd erupted in cheers and applause. When they finally quieted down, President Superbama gave one of the best speeches of his career. Good evening. I'm Superman. I can do anything. I'm here to tell you that never in the history of our great nation, America, has there been a candidate more qualified to be President than Wonder Woman. Not me. Not Steve Trevor Clinton. Sorry, Steve. I'm ready to pass the baton to Wonder Woman. Wonder Woman, now the world is ready for you and the wonders you can do. In your satin tights, fighting for our rights and the old red, white and blue. The crowd chanted, "USA! USA! USA! Now, I watched the Legion of Doom convention last week. There was a lot of negativity and fear-mongering, but that's not what America is about. We, in public office, have a high moral standard to meet. In this world, there is right and there is wrong... And that distinction is not difficult to make. The powers we have... The things we do... They're meant to inspire ordinary citizens... Not intimidate them... Not terrify them. I accomplished a lot in eight years, but there is still a lot that needs done. Well, maybe now if we elect Hillary Woman, we'll get there. That's what America is all about, really. That's the American Way. Life, liberty and the pursuit of happiness. None of us are forced to be anything we don't want to be. When I was young, I knew I would be someone different when I grew up. I would leave home and make a new life for myself. A new start, a second chance. When I first went to Metropolis, it was filled with people who'd done the same thing. People from all over America, from all over the world, who went to the city to live the lives they wanted, to be the people they wanted to be. That's the idea that America was founded on, but it's not just for people born here. It's for everyone. I'm not an idiot, Luthor. I know there are bad men in power and the world is not an equitable place, but you can't throw morality in the garbage just because life's tough. You see, Hillary Woman knows that we are stronger together. That the world works best when we all work toward a common goal of peace and prosperity. We don't need Trumpocalypse to be a self-proclaimed savior for us. Trumpocalypse, you'll never be Superman. Because you have no idea what it means to be Superman. It's not about where you were born. Or what powers you have. Or what you wear on your chest. It's about what you do... It's about action. I don't know what hole you crawled out of or where you came from, but I'm sending you back! It was a real crowd pleaser. There was a great celebration when Superbama returned to the Hall of Justice that evening. Hillary Woman even baked cookies. Meanwhile... in the darkest, dampest, dankest corner of the Legion of Doom, Trumpocalypse fired up his Twitter-Ray and murdered a puppy in a fit of rage. Your regularly scheduled programming will not be seen tonight so that we may bring you the following ABC Special Presentation, Part Four of The Super Friends Go To Washington. 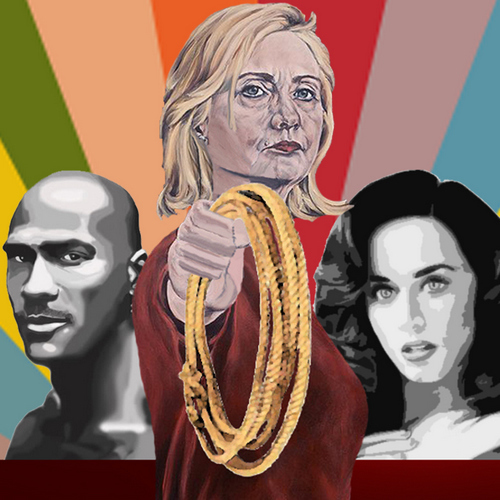 Starring: Hillary Clinton as Wonder Woman. With special appearances by Ted Danson, Mary Steenburgen and Kareem Abdul-Jabbar. With a musical performance by Katy Perry. When we last saw the Super Friends, they were celebrating in the Hall of Justice after Superbama, Batbiden and Robin Tim Kaine had silenced Trumpocalypse... for the moment. They gathered at Watch Tower to prepare for Wonder Woman to address the nation. Celebrity friends of the Super Friends, Ted Danson and Mary Steenburgen took the stage to speak of a world where everybody knows your name. Watching on a mega-screen from his control room at the Legion of Doom, Trumpocalypse banged his tiny fist on the control panel and shouted, "Damn you, sitcom actors with you rapier wit!" Then he murdered Scott Baio in a fit of rage. Donald Trump, you’re asking Americans to trust you with their future. Let me ask you: Have you even read the United States Constitution? I will gladly lend you my copy. In this document, look for the words – look for the words ‘liberty’ and ‘equal protection of law.' You have sacrificed nothing and no one. "I was viciously attacked by Mr. Khan at the Democratic Convention. Am I not allowed to respond?" Finally, the moment everyone had been waiting for, Princess Chelsea introduced her mother and the next President of the United States, Hillary Wonder Woman. Hillary Wonder Woman landed her invisible jet on stage. An amazed crowd watched as she seemingly appeared out of nowhere. My fellow Americans, I am the Goddess of Truth. Fellow Americans, Super Friends, of all people you know who I am. Who the world needs me to be. I'm Wonder Woman. And so I accept your nomination for President of the United States. The crowd chanted: "Hill-a-ry! Wo-man! Hill-a-ry! Wo-man! My fellow Americans, we don't need a leader who claims he can make America great again. America is already great! I know the facts about Trumpocalypse. He's a terrorist organization of one, driven by greed, not ideology. He's also terrifying. Borderline obsessed. Thriving in a darkness I forsook ages ago. Filthy, ill-begotten awful-spawn! You dare threaten a daughter of Themyscira?!? If the prospect of living in a world where trying to respect the basic rights of those around you and valuing each other simply because we exist is such daunting, impossible tasks, then what sort of world are we left with? And what sort of world do you want to live in? And so my fellow Americans, please take my hand. I give it to you as a gesture of friendship and love, and of faith freely given. I give you my hand and welcome you into my dream. The crowd went wild. Balloons were dropped. All the Super Friends joined Hillary Woman on stage and sang a chorus of "Get us out from under... Wonder Woman!" "No more Mr. Nice Guy. The gloves are coming off." He then desecrated the corpse of Scott Baio in a fit of rage. This concludes the Thursday Night ABC Special Presentation. Now back to your regularly scheduled programming.